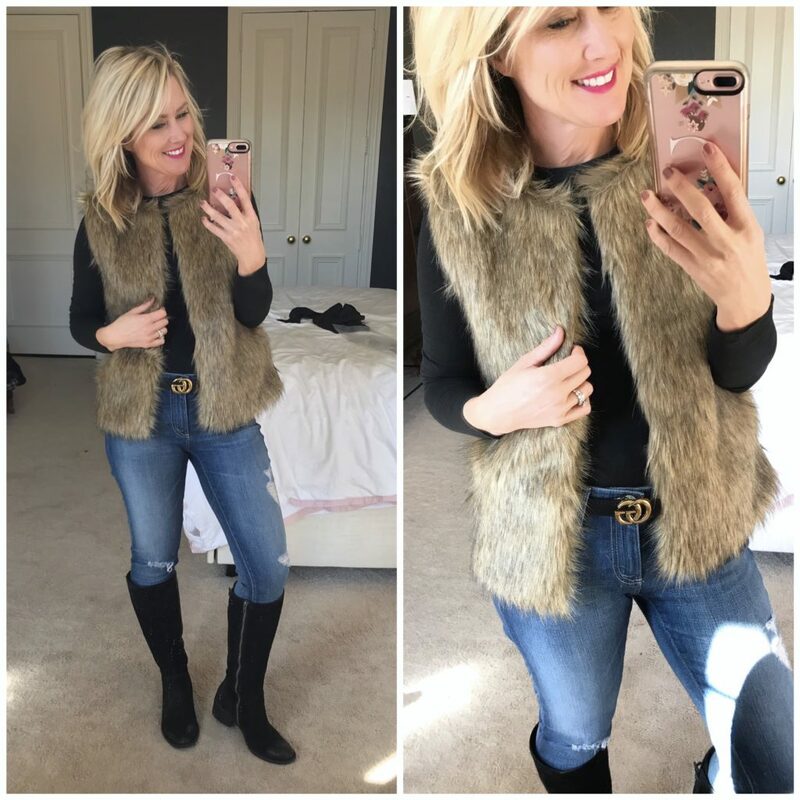 Amazon Fashion Finds | November | hi Sugarplum! Cheers to Friday, friends, and the weekend ahead! We had an early peek of Winter this week, with 35-degree days…which was kind of fun, but we’re relieved to see sunshine and 60 for the weekend! We put our tree up last weekend (I was too excited to see what our new flocked tree looked like! ), but I’ve yet to add a single ornament. I thought it would feel weird to have it up so early, but I like being able to take my time decorating it! So as it stands, our Thanksgiving Table sits in the glow of a Christmas tree! Thanks for all your love this week on the Gibson x Glam Holiday Collection, as well as the latest with our pups, and some Work to Weekend inspiration. I can’t wait to hear how you like your holiday tops, and see pics!! 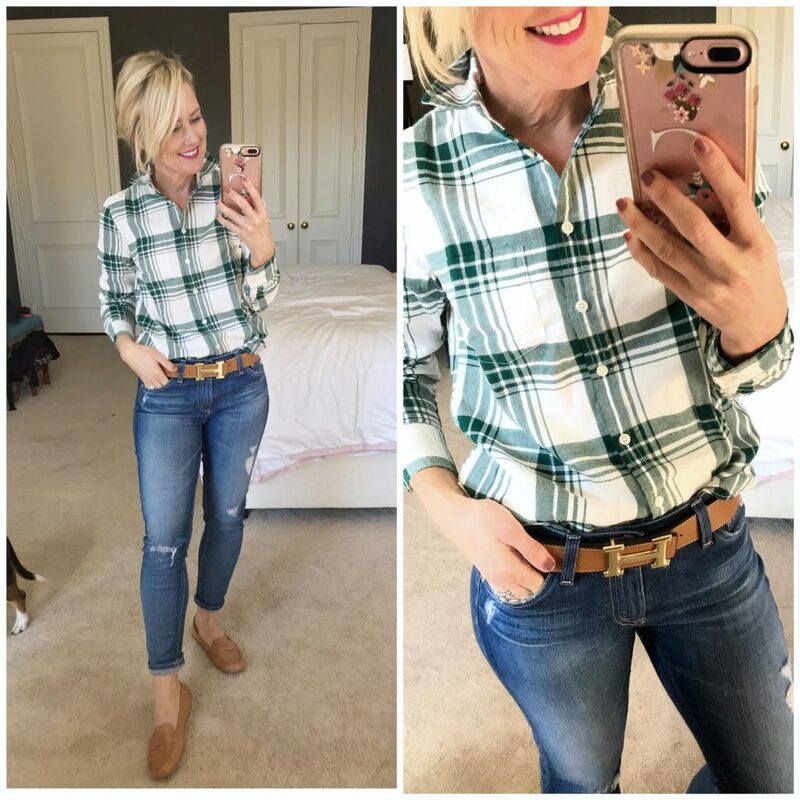 Today I’m excited to share some new fashion finds from Amazon. These have quickly become reader-faves, and even though it takes intense digging to find the good stuff, I love the challenge of discovering such gems! I certainly try-on more misses than hits (hence why I choose mostly items with free returns! )…but there are fashion gems to be found, and at amazing prices. Pair that with the infamous Amazon fast, free shipping and returns, and we’ve got ourselves a style jackpot! This month is a great assortment of sweaters, coats, pajamas and holiday dresses…and here is the best of the batch. Okay, let’s start with the best in show…this insanely chic moto jacket!! First up, in comes in five great colors and the price is unbelievable, especially for the quality! The faux-leather is spot-on, and the shape is feminine with a fitted shoulder and nipped-in waist. Wear it with the sweatshirt hood for casual styles, or remove it for an edgier, dressier look. Fit Tip: I’m wearing the Brown color and size small. This jacket was so popular last month, I had to try the longer version. And yep, it’s a winner, too! 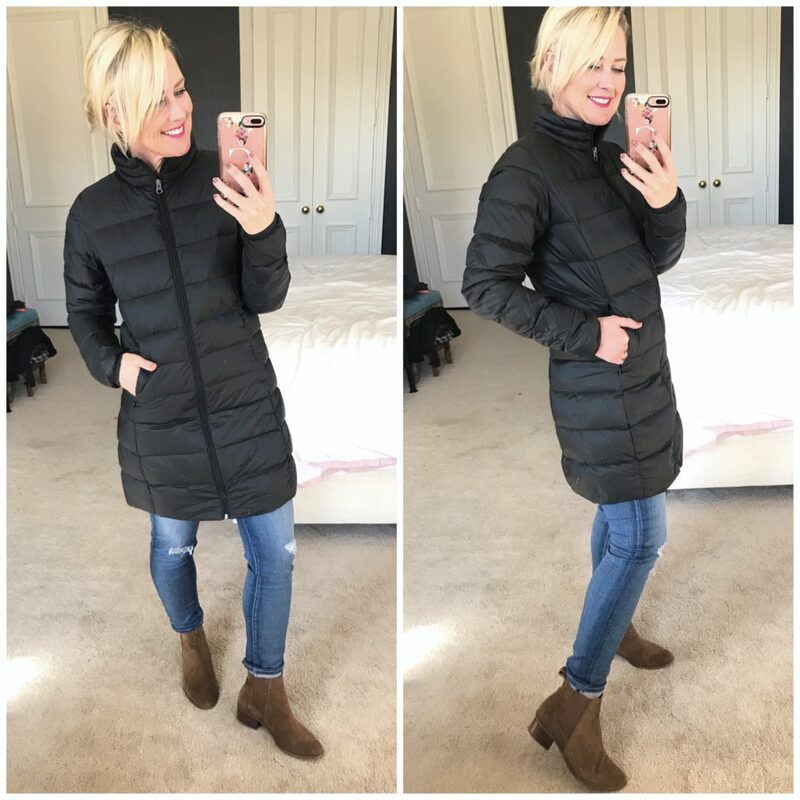 It’s not overly-puffy, and hugs the body well for a flattering, and warm fit. I love the longer length for covering the bum…perfect for Friday night football games on the metal bleachers! I can’t speak to the warmth factor in significant weather, but it’s great for milder climates. It also comes in nine fun colors. Oh, and it has a little attached pouch it folds up in…so it’s packable and compact! Ooops, I ordered it again! 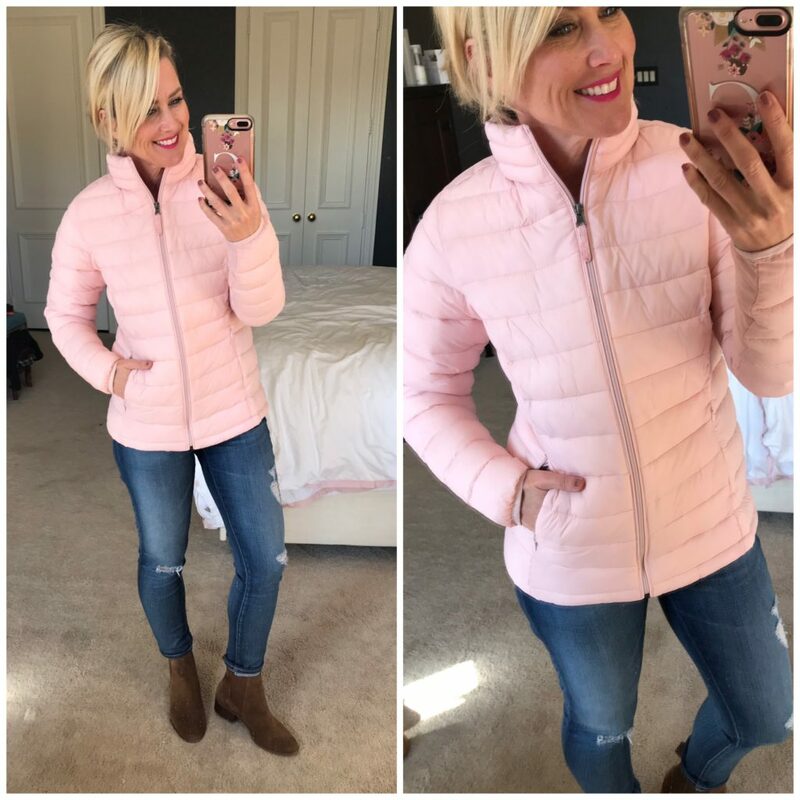 I loved this jacket so much in our last Amazon Fashion Haul, but already have a short black coat…so of course I had to try it in pink. Same fit as the longer version, with the packable option. And one more…the same coat in vest version! So cute and lightweight, it’s impossible to choose just one color! 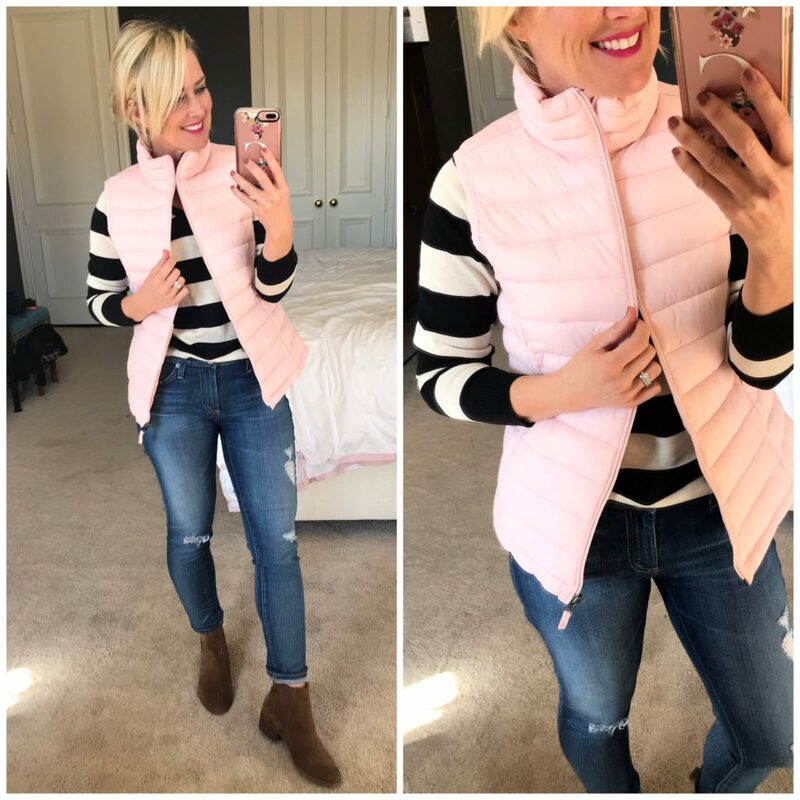 Moving on to different outerwear, this faux-fir vest actually came in a bag that read, ‘This may look awful when you unpack, but the blow-dryer will bring it back!’ Say what?! The stuff you find on Amazon, y’all! But guess what?! Mine wasn’t weird or awful at all! It came out of the package looking just like this! A fun faux-fir that looks incredibly expensive for only $25! 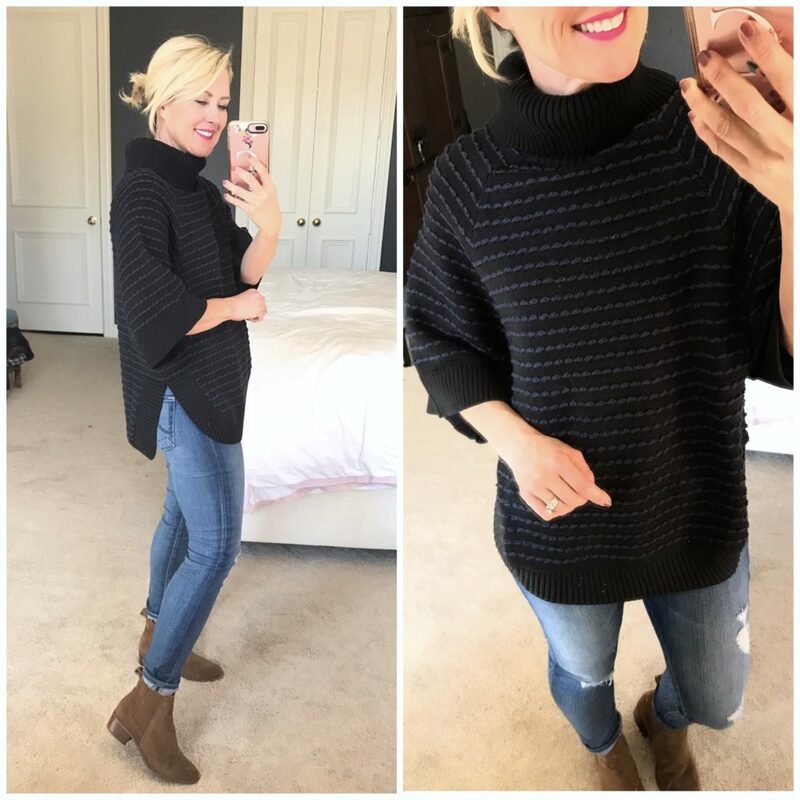 Let’s move on to sweaters…my fave category this time of year. I’ll admit, sweaters have proven to be the trickiest to find on Amazon. Many are just too ill-made or look and feel too cheap to recommend. But my persistence paid off, and I found some serious winners this round! Starting with this gorgeous sweater tunic…it’s the softest material with a relaxed fit and ribbed mock neck. I’m crazy about the shades of blue, and high-low hem with side split. It comes in three colorways, each cuter than the next! 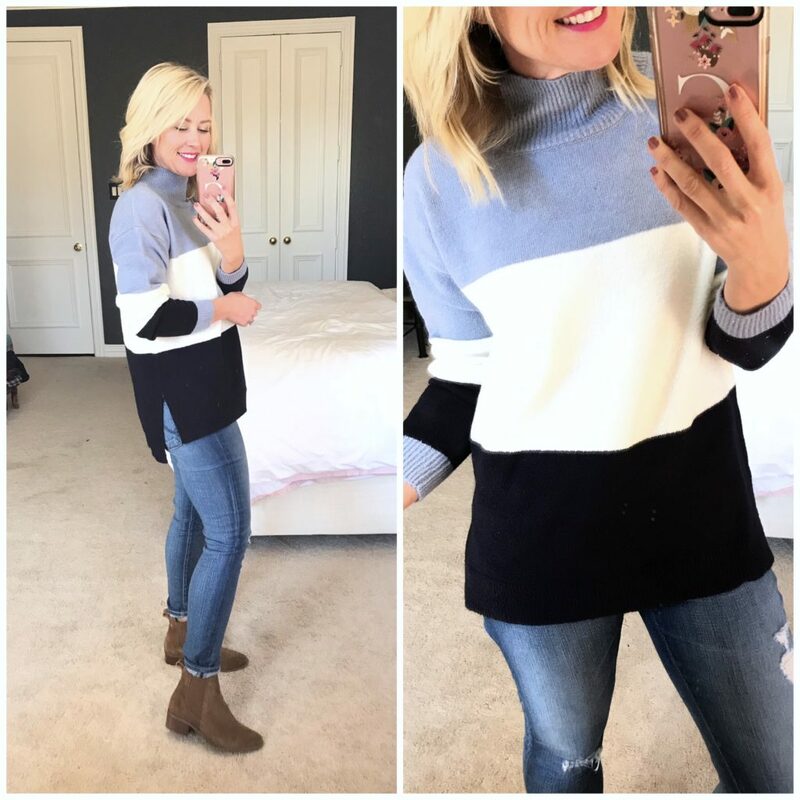 Another fun sweater option, this tunic would be darling layered over a long-sleeve tee and leggings. The black and navy combo is unexpected, and totally works. The turtleneck is relaxed and not constricting, but not quite a cowlneck. 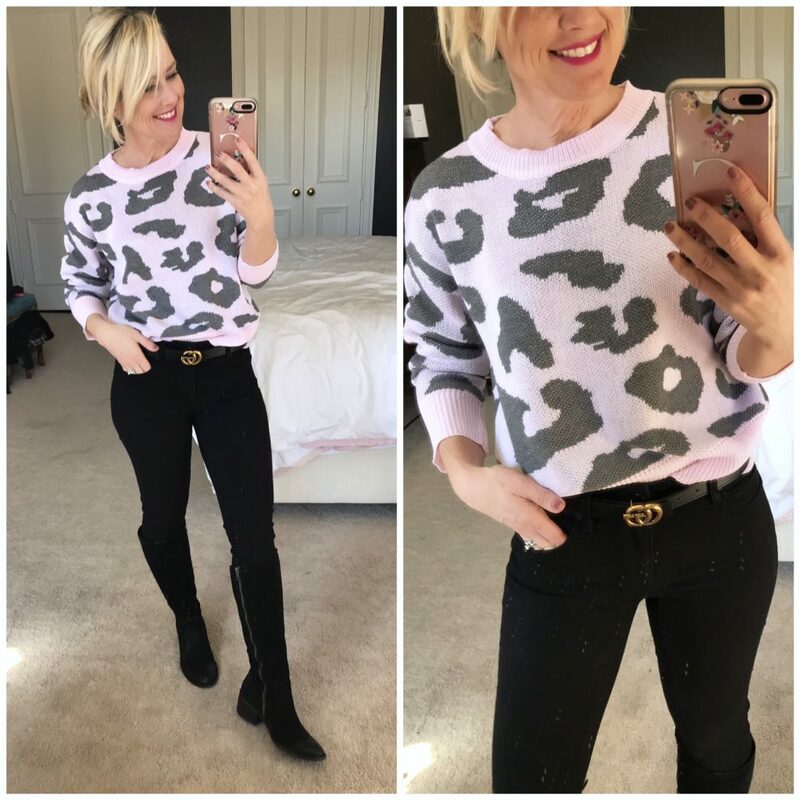 I hesitated to share this sweater because it definitely feels like a single-season purchase…but the pink leopard is so cute and the price so good, that I thought it may be worth it for you! It’s soft and not cheap-looking in person, with a slightly cropped length. But these black jeans, prepare to see a lot of them!! They fit so well, and have magical booty-enhancing powers! 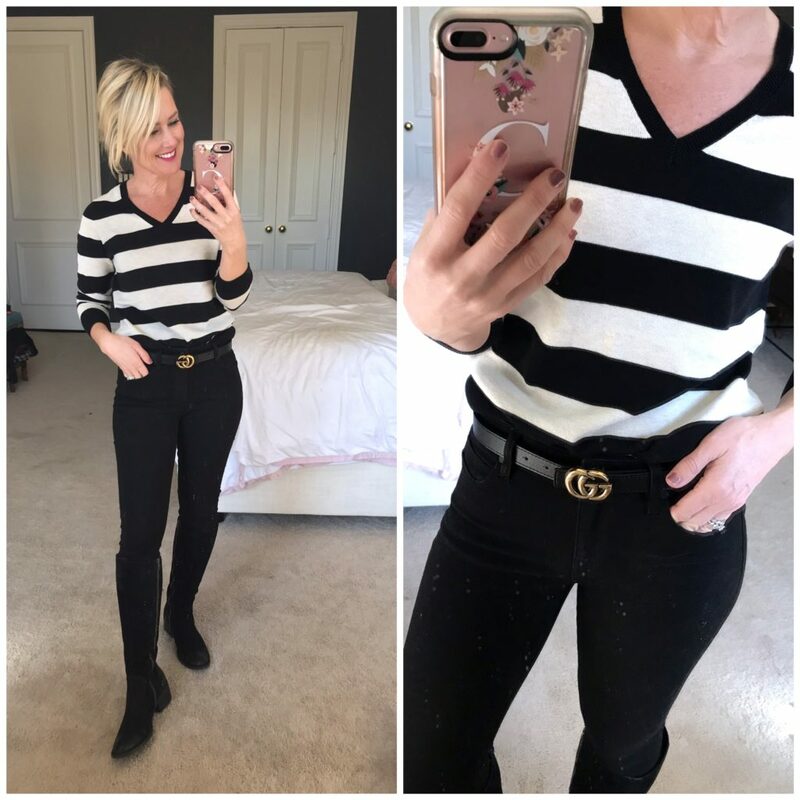 Every girl’s closet needs an assortment of black and white stripes…they’re actually my favorite for layering. The stripes work with so many patterns, and the black grounds any color you add to it. This sweater is a fairly lightweight knit, that works better as a base layer than a top layer. It’s soft and stretchy. That said, you get the same look and style, for a fraction of the cost, and no one is likely to be the wiser. 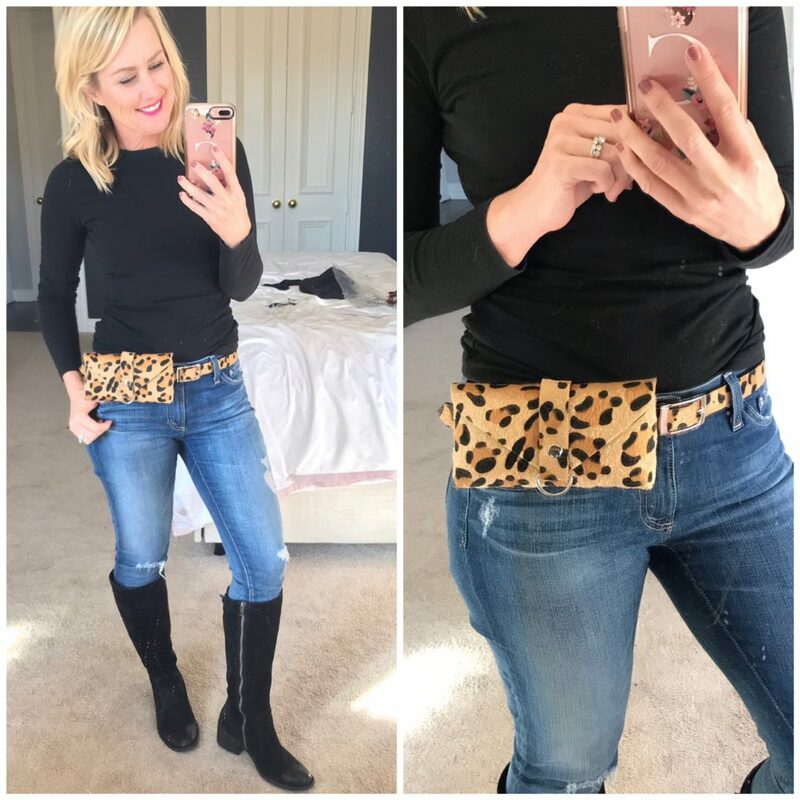 Speaking of belts, I shared a belt bag as a fun alternative a few months ago, and couldn’t believe how many of you asked about it! So when I spotted this leopard, I had to try it! It’s faux calf-hair, but looks and feels really good! The proportion is good on the body, and it will hold a phone and a lipstick (albeit a super-tight fit for an iPhone Plus!). Fit Tip: I’m wearing a Small, and it’s got plenty of extra length. I adore the new Christmas print…subtle, but still festive! Plus, these launder beautifully. Both my oldest and newest pairs still feel exactly the same. They’re on the pricey side, but you’ll own them for years, and I can’t recommend them enough! Fit Tip: I’m wearing a regular small, tall sizes available, too. This lightweight pajama has a waffle weave and scoop neck. They’re fairly soft, with a jogger style bottom that keeps them from dragging. They wouldn’t be my first choice, but I wanted to include them in case you’re looking for this cute pattern for holiday. These classic plaid pants are a lightweight flannel with elastic waist and drawstring. The top is a soft, sturdy cotton. Mama SP prefers a button-shirt style pajama, so these next two are for her! These polka dots are a heavy flannel that’s soft and warm. I love the dark plum with pink trim and satin bow. These sturdy cotton pajamas look just like J.Crew, but a fraction of the price. They’re thick and soft with a sturdiness to them. And since it’s holiday season, how about a few gorgeous dresses?! I absolutely can not believe how lovely this dress is, and well-made! It fits beautifully with comfortable, stretchy lace across the shoulders and arms, and a flattering fit-and-flare shape. It’s fully-lined, too. Absolutely can’t go wrong with this one! And the price is unbelievable!! Fit Tip: I’m wearing an XS and still had a little extra room. So consider sizing down if you’re in-between. A similar dress, but in a long-sleeve…this lace makes a flattering faux-wrap shape across the torso accenting the waist. The lace on the arms is soft and a little stretchy, so it’s comfortable and easy to wear. Fit Tip: I’m wearing a XS, and it feels a little tight through the arms and chest, so I’d size up one. 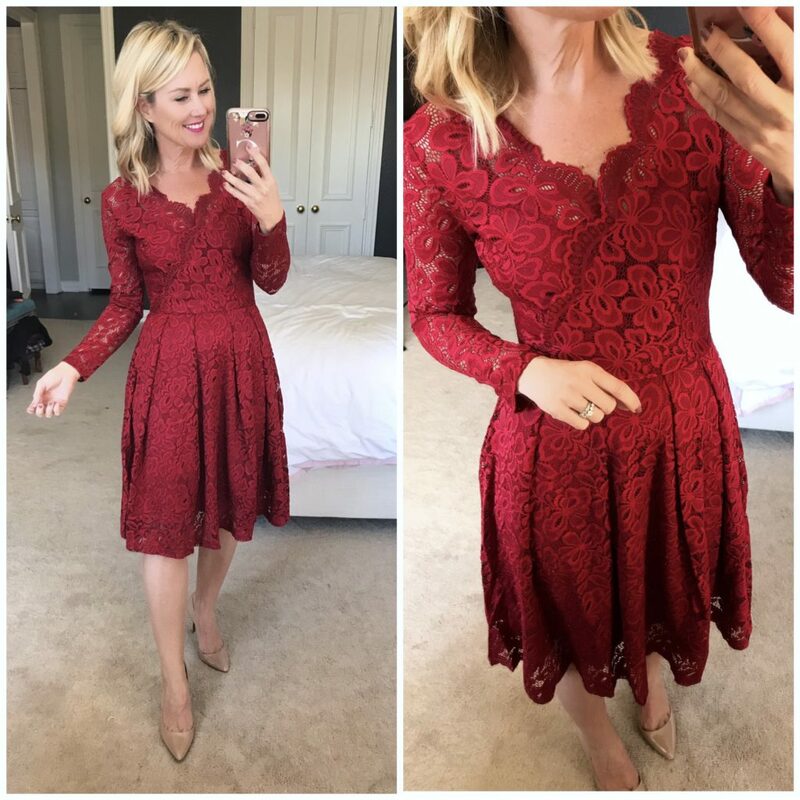 I love a good lace midi dress, and this red one is so chic! I’ve seen similar dresses for over $500, and this one could easily pass for that! The lace is thick with a slight fit and flare shape, and fully-lined. It’s a gorgeous dress, perfect for holiday, weddings, and cocktail parties year-round. And get this, it’s under $30!!! Now let’s talk about those shoes!! Oh my word, they’re adorable and sassy and so chic! I wasn’t expecting much for the price, but am totally blown away by how good they look! 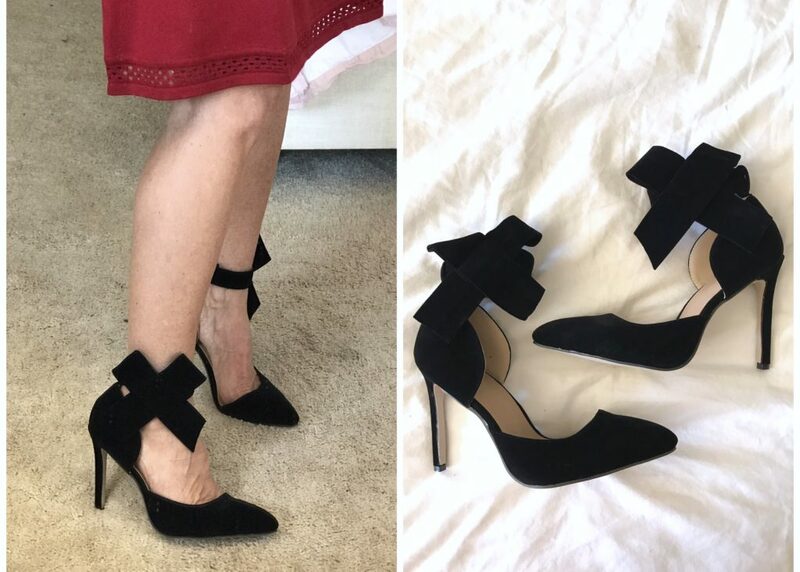 They’re made of faux-suede, and the ankle strap wraps and attaches with hidden velcro…so you can adjust to a wide range of sizes. Wait until you see all the darling colors! And they’re $30!! Fit Tip: They don’t have half-sizes, so I rounded up. And finally, I found some great new workout wear…starting with these high-waisted cropped leggings. They’re soft with a good sheen and perfect amount of lycra to hold you in, and still move easily. The sports bras are a solid fit, and have built-in padded cups for a little shape (most sports bras flatten me). Plus, they come in a 2-pack, so a great price! 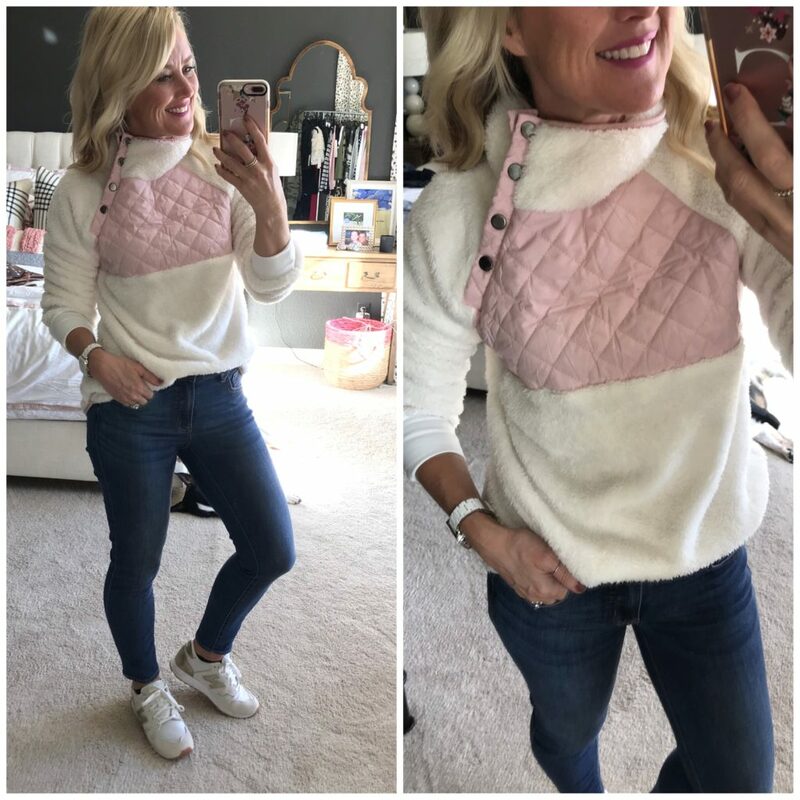 I don’t think the pullover is intended for athleisure, but I liked it as a light top layer. It’s too sheer to wear alone. Fit Tip: I’m wearing a Small in the bras (so size up one), XS in the leggings, and Small in the tunic. This cozy pullover (available in several color options). 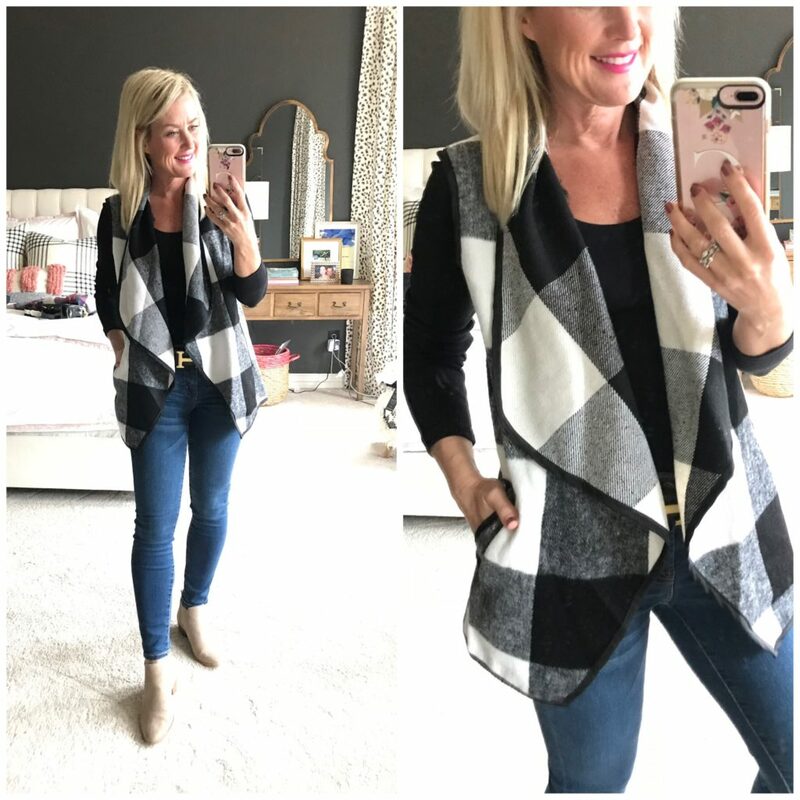 This open front cardigan vest was a definite reader-fave, and you scooped it up in all the colors! And these accessories all made the top picks. Clearly y’all love a good look for less! As for the random finds, I picked up these blue-light glasses, and they’re game-changers for me! Obviously I spend a ton of time on the computer and phone, and by mid-day my eyes burn and ache. These block the blue-light illuminating from the screen, and take away the strain. I can honestly feel a difference as soon as I slip them on. They do create a slight tint, so I don’t use them when editing photos. What have you ordered from Amazon lately? What’s your favorite fashion find from this month? Is there something you’d like to see more of next time? Great finds!! 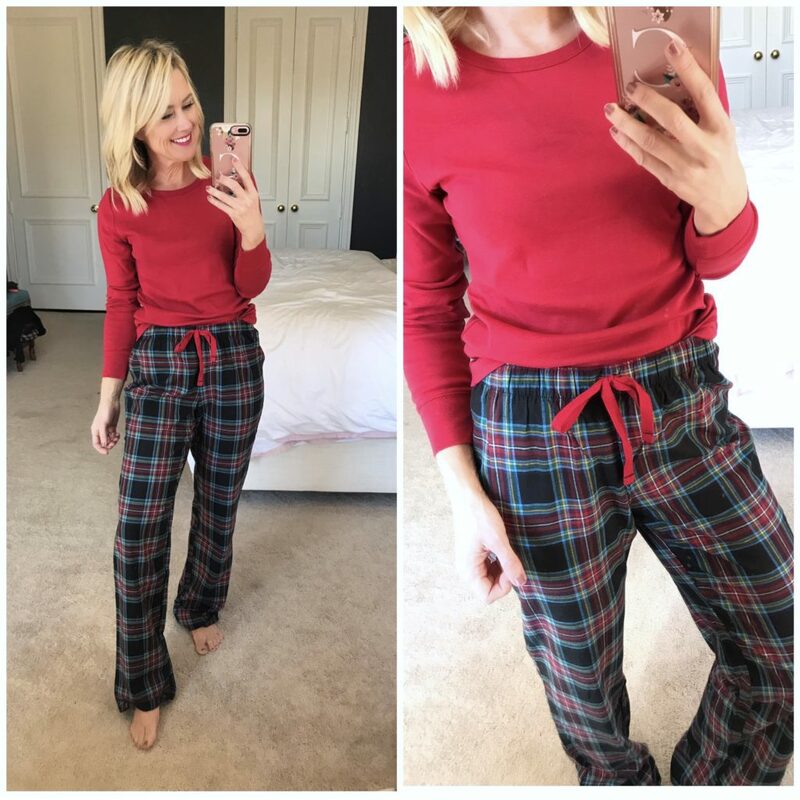 Love those super soft Christmas jammies! I’ve been looking for a faux fur vest for a while and love the one you featured, so it took me about 10 seconds to decide to order it. Thank you! 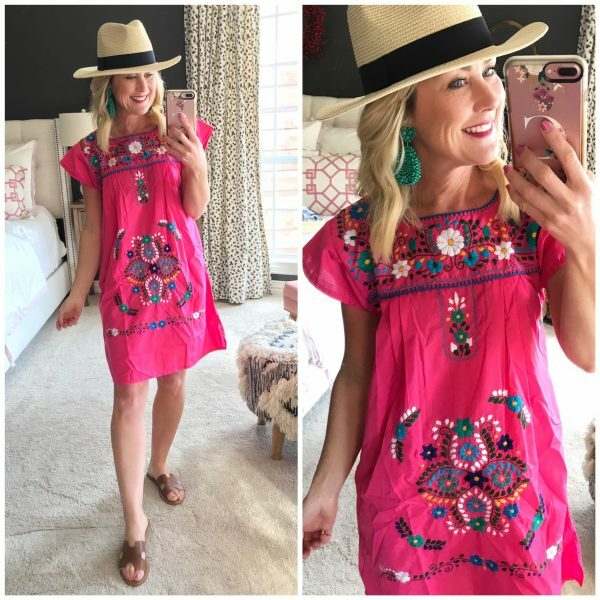 Such cute stuff – you are costing me a lot of money, my fashion sherpa :). But I do hope you get credited for it somehow….the only way I learn about fashion any more is via influencers like you (well, mostly you). 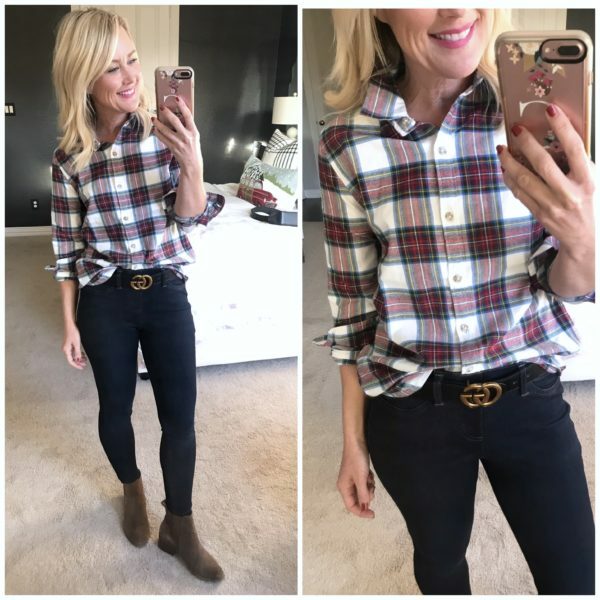 Just ordered the GG dupe belt and, earlier this week from a cruise ship no less, ordered the Hunter boots from Nordstrom (on sale!). So many cute finds! I actually have the striped J Crew pjs and they are so worth the price! Looks like you found a good dupe though!! 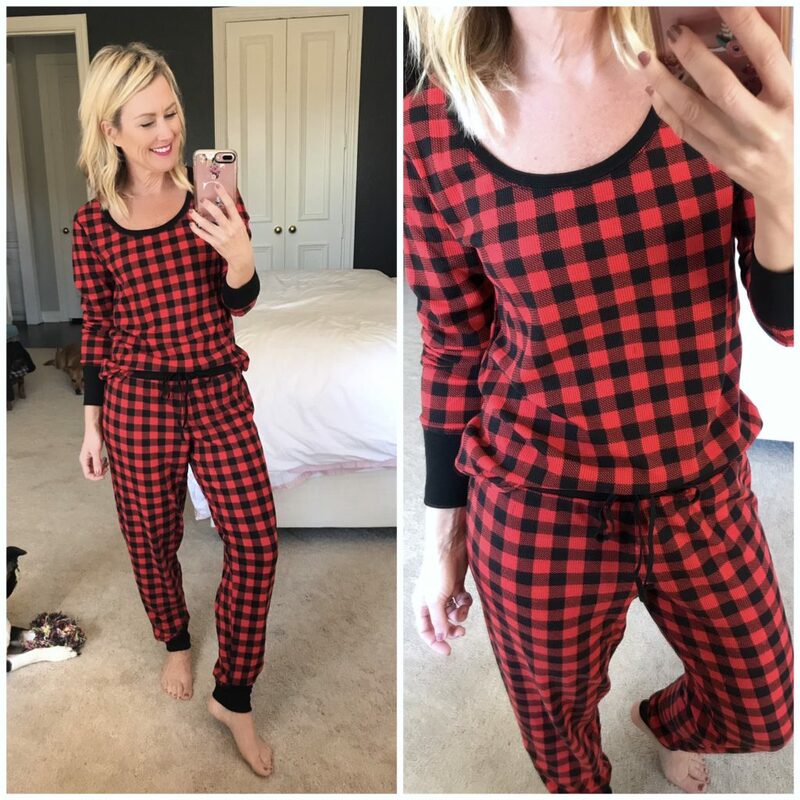 Agreed…I love the J.Crew pjs (I have the short version), but these do a good job of Look for Less! Love good Amazon finds! I may need that lace dress for an upcoming holiday party – it looks beautiful! You won’t even believe how good it is!!! This is my FAVORITE series on your blog 🙂 I look forward to it every month! Yay! I’m so happy to hear that! I love putting them together! I didn’t see the glasses for tired eyes….did my tired eyes miss them? Just wondering how big your closet is. Mine is really big, but I couldn’t shop every month and still have room. Even if I purged on a monthly basis. I’d love to see a pic of your space! LOVE your amazon finds posts!!! 🙂 So good! Ordered the H belt last month and can’t wait for it to arrive. 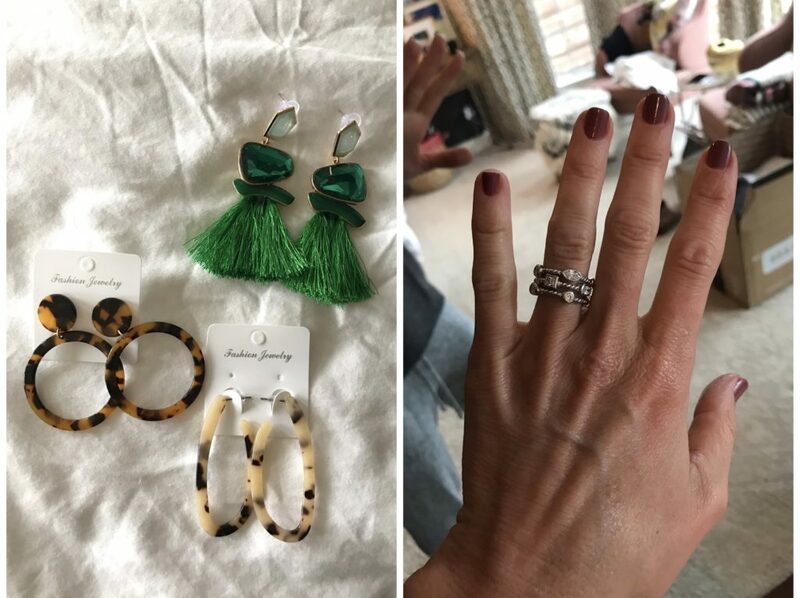 Also have ordered the leopard earrings, green statement earrings, and just ordered that leopard bag/belt to use on a girls’ trip to NYC soon! Love those dresses too! Gonna grab the longer packable cost for my mom, but it’s only available in XS/S in black for now. :/ I’ll keep crossing fingers. 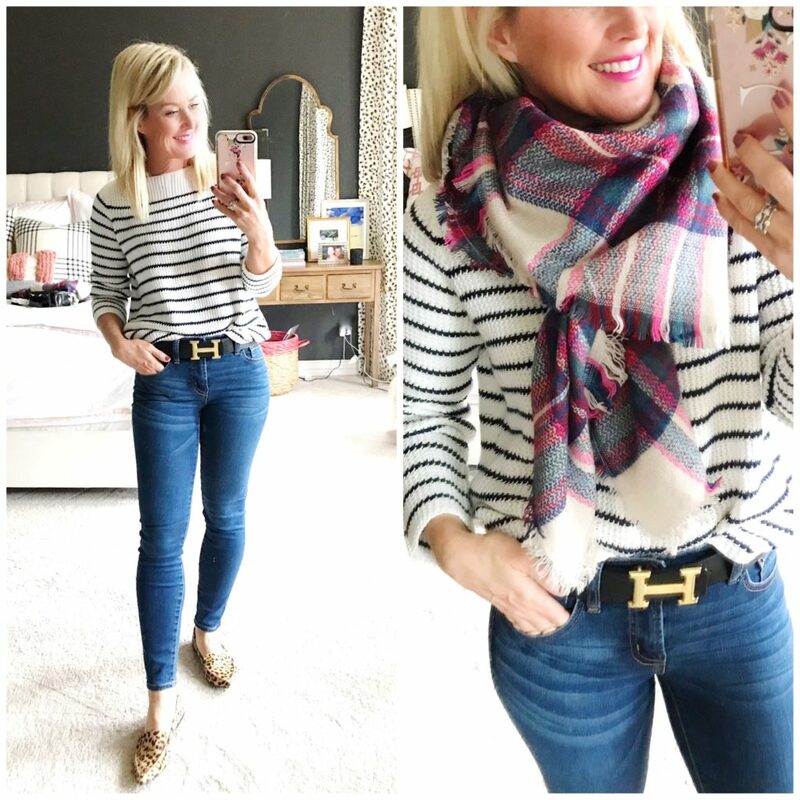 Thanks for the fashion finds! I’m thrilled you like them, Sharon!! Thats a great idea to get a team color! Love your posts! Never does a post go by that I don’t think I “need” something. Are your Steve Madden brown booties the “Cognac Suede” color that is currently available? It another color that’s not currently listed. Yours look a little less red. Thanks, Cassie! Thanks so much, Liane! I’m thrilled you find inspiration here! And yes, I have the cognac, they look a little darker in some light. I love them!